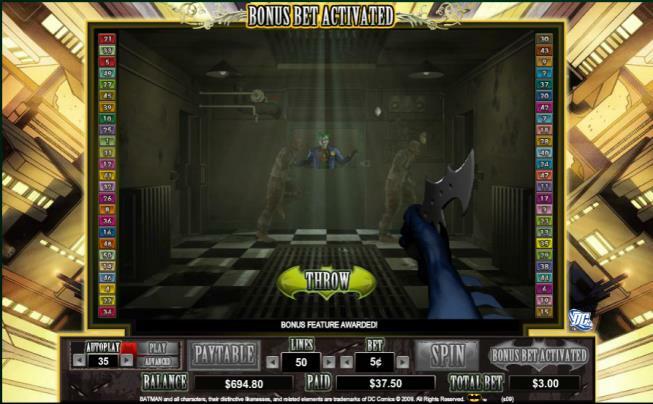 The Batman slot offers you two very impressive bonus features. The Re-spins feature allows you to claim superb prizes, while the Descent into Madness Feature, accessible only when the Bonus Bet is activated, allows you to go after the Joker in an attempt to pocket up to 100 times your original stake! The Re-spins Feature is activated when Commissioner Gordon and the Bat Signal appear on Reels one and five. Should Gordon appear on reel one, the Bat Signal must appear on reel five and vice versa. Once this has occurred, any winning combinations will be paid and reels two, three and four will merge and turn black, allowing Batman’s infamous signal to appear and land on one of the reels. This reel is then held and you are granted three free spins with any winnings during this time doubled. 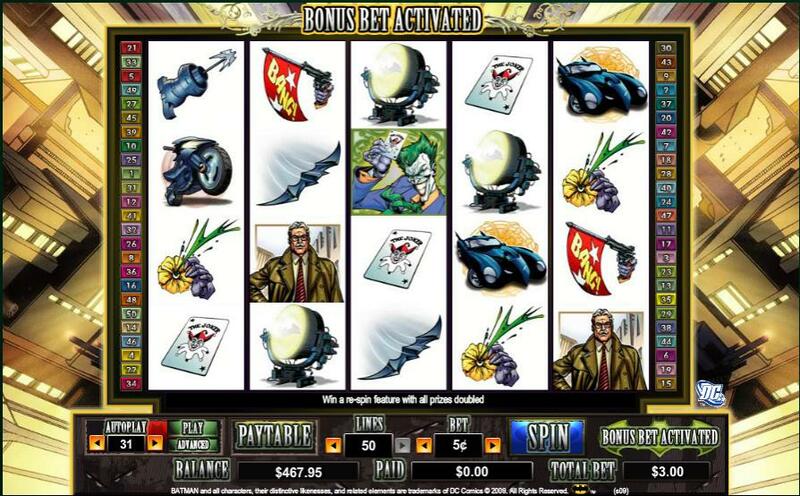 Should Commissioner Gordon and the Bat Signal appear on reels one and five during these spins, a further three spins will be added to your total, a running total which will be visible towards the bottom of the game screen when the Re-spins Feature is active. In the bottom right hand side of the screen you will find the BONUS BET button which, when selected, will bring all 50 paylines into play and increase your current wager by 10x the number of credits played per payline. When this is activated, scatter prizes are multiplied by 50 which can result in some super payouts. You will also have the chance to access the Descent into Madness Feature which is automatically triggered when three or more Scatter symbols are present. 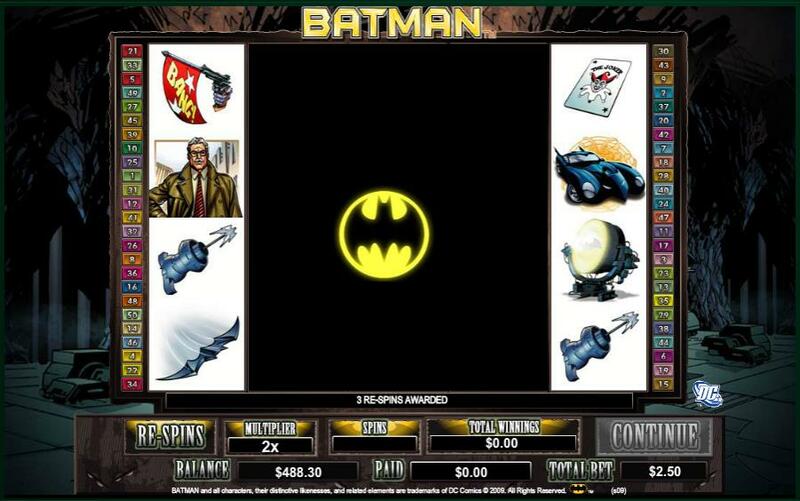 Matching three or more Scatter symbols while the Bonus Bet is active will allow you to access the Descent into Madness Feature, a round in which you take up the role as Batman. Armed with your trusty Batarang, you must take down as many inmates as possible before attempting to trap the Joker, an accomplishment that will see you win 100 times the triggering bet.